Fundamental to my teaching philosophy is student-centered, inquiry-based learning within an interactive lecture. With shared control of the classroom, students have greater responsibility, and therefore greater motivation, in their learning. The pedagogical approach that I use accommodates a diversity of learning styles and incorporates scientific research and multimedia to encourage critical thought and inquiry. I believe these learning experiences are strengthened by student diversity. Within my courses, I foster ethics in biology and teach students to be inquisitive, critical citizens with a firm understanding of humanity’s dependence on the environment. I integrate a variety of teaching approaches to engage all students in the learning process. The lecture component of a course is important to disseminate information to those students who learn best by listening or writing notes. To accommodate visual learners, I use presentations that conceptualize ideas with diagrams and pictures. I use a course website to facilitate learning and discussion among students outside of the classroom. Throughout lectures, I ask students questions, integrate individual and group activities, and facilitate small group and classroom discussion for students who learn concepts more easily by verbalizing them. In the undergraduate course Introductory Science at Augsburg College, I introduced new topics with a persistent, unanswered question in ecology. Before lecturing on the various hypotheses proposed by scientists, students independently developed their hypotheses followed by small group and classroom discussions. This approach was successful as it enticed students to integrate information they had learned thus far to develop a hypothesis that was then compared to existing hypotheses of biologists. Students further gain comprehension and ownership of content through peer teaching. In the seminar on The Ecological Role of Secondary Compounds in Plant Communities (UNL), I asked each student to explore a competing hypothesis proposed to explain the existing variation in plant defenses. Each student gave a short lecture explaining the rationale of the hypothesis and its current support, which was followed by a class discussion comparing the hypotheses. By holding students accountable for their own learning and transforming them into peer teachers, I aim to motivate student learning, inspire critical thought, and build confidence. With Drs. Jennifer Penner and Peter Gess (Hendrix College), I co-authored educational materials in the SESYNC Case Study Collection (2017). Through the case study, students learn about the structure, behavior, and complexity of socio-environmental systems through transdisciplinary teamwork and problem-solving. Students examine the history of the Three-Wattled Bellbird Biological Corridor (BBCP) and learn the perspectives of different stakeholders to develop a management plan for the BBCP in interdisciplinary and transdisciplinary teams. Students then apply these concepts to develop a biological corridor in a new location and learn the importance of scale and context in addressing socio-environmental problems. Through research, I engage students in scientific inquiry. Students learn how to ask essential questions, aiding them in becoming life-long learners. 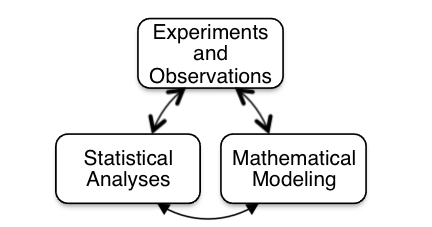 I emphasize the benefits of integrating empirical and quantitative approaches to formulate hypotheses and design experiments. In the course Tropical Ecology in Panama (OSU), undergraduates with diverse academic backgrounds developed hypothesis-driven questions, designed field experiments to test their hypotheses, analyzed data, and interpreted their results. In Quantitative Population Biology (OSU), students develop independent research projects related to population demography. Within my courses, students discuss biological concepts to stimulate critical thought, internalize concepts, and build fundamental skills for communication. To maximize this learning, I integrate multimedia approaches within my courses, including informal and formal writing assignments, presentations, and videos. In the seminar on Secondary Compounds, students wrote a review article on a thesis topic they developed, which began with the development of a research question and an in-class presentation of relevant primary literature. Throughout the semester, students were involved in informal writing assignments (including freewriting, exploratory essays, and tree diagrams) to encourage brainstorming and aid in developing their arguments for the article. The review article, written for submission to an ecological journal, underwent multiple revisions in which students gained feedback from their peers. This formal comprehensive writing assignment enabled students to research, evaluate, and synthesize information and introduced them to a disciplinary writing style. Students also gained experience in the peer review process, an essential component of research. In Tropical Ecology in Panama, students wrote blog posts to reflect on daily activities and communicate recently learned biological concepts to a non-scientific audience. For their two research projects, students communicated the results and significance of their research through formal presentations to peers, research articles following the guidelines of an ecological journal, and engaging and informative videos for a public audience. Given the cultural diversity of students within the classroom, there will be a diversity of thought and problem-solving techniques that enriches each class session. Through discussion among students and myself, I relate the diversity in student backgrounds to ecology. To engender classroom discussion on the perceptions of ecology from students with various backgrounds, I inquire of students on the first day how ecology relates to their academic major and life outside of school within a writing assignment. By creating an open environment, students will gain self-confidence in thinking independently and communicating differing ideas. I am conscientious of differences in academic, personal, and cultural backgrounds in order to create an open and strong community within the classroom. By respecting students’ opinions, knowledge-level, various thought processes, and different communication abilities, I aim to maximize student learning. Within my courses, I will promote an understanding of humanity’s dependence on Earth’s ecosystems, tolerance for a diversity of thought, and the confidence and ability to question and evaluate information in our increasingly global and informationalized society. Through mentorship on research projects and promoting a student-centered, inquiry-based classroom, I aim to enhance cognitive and communication skills and inspire stewards of our ecosystems.